Collin Mason, left, and Felisa Sze were part of the team that built the mechanical and electrical systems of the TigerBot autonomous robot. TigerBot is big for its age. At age 7, now standing over 5 feet tall, TigerBot is the latest version of a humanoid robot being built by RIT engineering students. While TigerBot has grown in size, its human-like systems also have improved, and students working on the project have grown. They are learning to apply cutting-edge robotics technology being integrated into today’s manufacturing, health care, tourism, security and even food service industries. “We went into TigerBot’s individual subsystems and asked how can we use novel, biomimetic design concepts to more truthfully replicate specific parts of the leg and how it actually moves,” said Collin Mason, one of six TigerBot project team members. 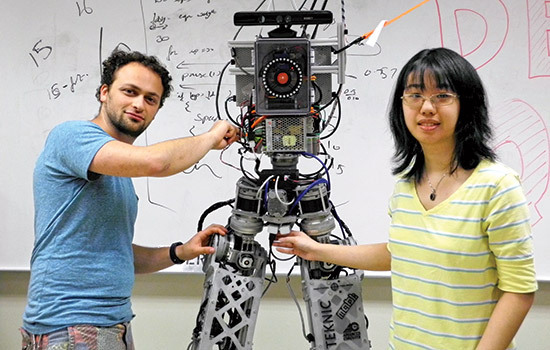 Built on information from past TigerBot projects in Professor Ferat Sahin’s multiagent bio-robotics lab, Mason’s team of mechanical and electrical engineers scaled the robot’s legs to average human dimensions. TigerBot’s graceful walking motion includes flexing at both knee and ankle joints, with slight range of motion in the hips. Students like Mason are keeping pace with today’s evolving robotic technology by exploring how a bi-pedal robot can be built to adapt to situations beyond programmed industrial applications. Projects such as this allow students to learn more about object avoidance technology as well as integrating voice recognition and machine learning concepts into robotics applications. In 2010, the TigerBot project aimed to build a life-like robot that could someday walk the halls of the engineering college greeting prospective students. It is one project in the Multidisciplinary Senior Design Program in RIT’s Kate Gleason College of Engineering. Projects follow tracks in biomedical, aerospace and vehicle systems, sustainable technology, printing and imaging systems and chemical and materials processing. But before building TigerBot or any other products, students begin the two-part course sequence in fall and coordinate teams of students from several engineering disciplines. Adding peers from RIT’s business, computing and industrial design programs, groups are modeled after teams in the workplace to show that the process from design to prototype to product includes many diverse, individual contributions. Design projects are often sponsored by corporate partners who provide some financing, technology and guidance in project management. A long-time partner for TigerBot has been Teknic, a Rochester-based manufacturer of motion control components. Its sophisticated motors and actuators power the robot’s limbs and systems. The company is on board for future improvements such as integrating arms, shoulder and neck systems. “We want to improve the dynamics but also use the sensors and encoders to gather more information about improving the overall system,” said Felisa Sze, a fifth-year electrical engineering student from Fairport, N.Y., who provided system programming for the project. She’ll continue work this fall and incorporate some of the project information into her master’s research. Like human children, growing up means becoming more independent. TigerBot is no different. As it flexes its electronic muscles, it is a project that is coming of age. To see TigerBot in action, go to bit.ly/tigerbot.